After breakfast leave for full day visit including 400-years old Jewish Synagogue, said to be oldest in South-Asian sub-continent; St. Francis Church- first European church in India and Dutch Palace- where one can find hand painted Chinese tiles and Belgian Chandeliers interior that gives exquisite look. 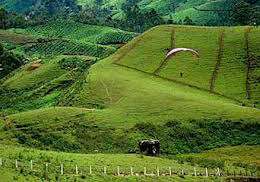 Besides these Cochin offers attraction such as visit to islands- Bolgatty, Gunda and Willingdon; museums- Kerala History Museum, Hill Palace Museum, Parishath Taamburan Museum; Chinese Fishing Nets and Santacruz Cathedral (Basilica). All these visits depend on prime interest and time as well. After breakfast leave for full day visit. Obviously visit places like: Christ Church- small, cozy and charming church with wonderful stained glass panels; Mount Carmel- oldest Roman Catholic Church in the region; Mattupetty Lake and dam (13 kilometres away)- surrounded by hills and forest where one can hire a boat for ride or walk down to nearby dairy and cattle farms; Top Station (41 kilometres, at 2200 meters height)- that has some of highest tea plantations in India; Eravikulam Park (16 kilometres)- where one can find endangered Nilgiri Tahr (ibex). After breakfast leave for full day visit to Periyar Tiger Reserve; a boat ride in Periyar Lake will definitely enhance your journey with an exotic view of wildlife in its natural habitat. After breakfast proceed to Kumarakom; embark on houseboat and relax. 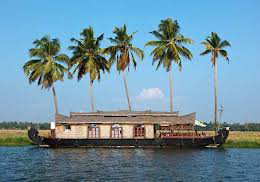 After breakfast cruise in the Kumarakom Lake from Kumarakom to Alleppey through narrow canals adjoining the wide lake; enjoy natural beauty in the surroundings. Meals are served on board so one can have lunch middle of the day.Alleppey- situated in south of Cochin, is the center for backwater cruises in Kerala. It has a large network of canals, which passes through the town, provides its lifeline and has a long sandy beach. It is also the center of famous coir products of Kerala. Nehru Trophy Boat Race- the most colourful snake-boat race in Kerala, which is held here on the 2nd Saturday of August every year. After breakfast proceed to Trivandrum; check in hotel and rest Trivandrum now known as Thiruvananthapuram is the beautiful seaside capital city of Kerala located in between 7-hills. The city gets its name from the word "Thiru Ananthapuram" meaning the city of Ananth or the abode of the sacred serpent Anantha, on which Lord Vishnu, the preserver of the Hindu trinity, reclines. After breakfast leave for day excursion to Kovalam beach; opportunity for sunbath. Also visit famous Padmanabhaswami temple.Kovalam lies on the Malabar Coast along the Kerala shoreline, which is just 16 kilometers ahead of Trivandrum. A sheltered natural bay endowed with unusual beauty has safe sea-pool free from high waves and surge. As the name "Kovalam" meaning a grove of coconut trees, here one can find abundant coconut trees along the beaches that gives a feel like paradise of nature.